The best pizza crust is made out of cauliflower. YES. Cauliflower. Plus it's gluten-free, grain-free, and dairy-free. Now, lets be real. This is not a soft, doughy crust that rips a part with ease. But it is so good! This cauliflower pizza crust is similar to a thin pizza crust. It has a crisp yet chewy texture that is firm enough to hold up to excessive amounts of toppings! You can taste the flavor of the garlic and spices, but it is subtle enough not to over power the ingredients you decide to put on top your pizza. Since this crust is free from refined carbohydrates, it doesn't leave you feeling tired and sluggish a few hours after eating! 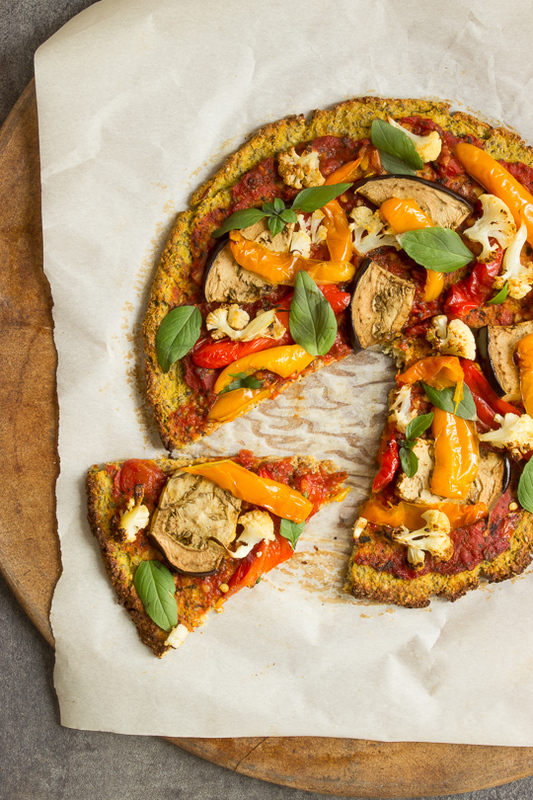 Its wholesome ingredients like cauliflower, chia seeds, almond meal and eggs make this crust full of fiber, nutrients and omega-3s that will keep you feeling full and energized. This crust really does come together quite easily. the first step is to pulse the cauliflower in a food processor until it looks like rice. After you have your "cauliflower rice", place it in a strainer or bamboo steamer over boiling water for 4-5 minutes. Once the cauliflower is tender, allow to cool for about 10 minutes (I like to speed this up by placing it in the refrigerator or even the freezer). After the cauliflower is coll enough to handle, place it into a nut milk bag or flour stack towel. Squeeze as much water out as possible. (This is a key step!! Don't rush the process. It takes me a good five minutes to get almost all off the water out). Once you have dehydrated your cauliflower, combine with the remaining ingredients until it forms a "dough ball". Spread the dough out onto parchment paper so that there is no chance of it sticking. I recommend making your crust about 1/2 inch thick. This will give you a crisp yet doughy texture that is thick enough to hold your toppings. Now slide the parchment paper onto a HOT pizza stone or cookie sheet. You'll bake the pizza crust for 20-25 minutes, or until golden brown. Take the crust out of the oven and top with your pizza ingredients and place back in the oven for 10-15 minutes. Preheat the oven to 400 F with the pizza stone or cookie sheet in the oven. Pulse the cauliflower in the food processor until it looks like rice. Heat water in a small sauce pan on the stove to steam the cauliflower. Once boiling place the cauliflower in a bamboo steamer or strainer and place over the water. Cover and let steam for 5-6 minutes or until tender. Let the cauliflower cool until you are able to handle it. (I usually wait about 10 minutes, putting it in the refrigerator or freezer to speed things up). Once cool, place in a nut milk bag or flour cloth towel and squeeze the water out. This will take about 5 minutes but DO NOT skip it! It is key to having a firm, non-soggy crust. In a medium bowl whisk the egg (or place chia egg). Combine the cauliflower and the remaining ingredients until a "dough" ball forms. On a piece of parchment paper, spread out the cauliflower "dough" about 1/2 inch thick. Slide the parchment paper onto the hot pizza stone or cookie sheet and place in the oven and bake for 30 minutes or until golden brown. For a crispier crust, you can flip the crust half way through or after the 30 minutes, before you put the toppings on. Just be careful, it could be fragile. Remove the pizza stone and put your toppings on the pizza. Place back in the oven for an addition 10-15 minutes, or until your toppings are warm and melty. When it comes to toppings, the possibilities are endless. I’ve topped this pizza with a simple homemade red sauce and roasted veggies. For the roasted vegetables, I used leftover bell peppers, eggplant and cauliflower that were in the refrigerator. I like making a large batch at one time and using them in various dishes throughout the week. . Dice the tomato and place in a sauce pan with the rest of the ingredients. Let the ingredients simmer and thicken up for about 5-10 minutes, stirring and crushing the diced tomatoes occasionally.